The Java console gives you the opportunity to manage how Java content is handled by your browser, under Windows. 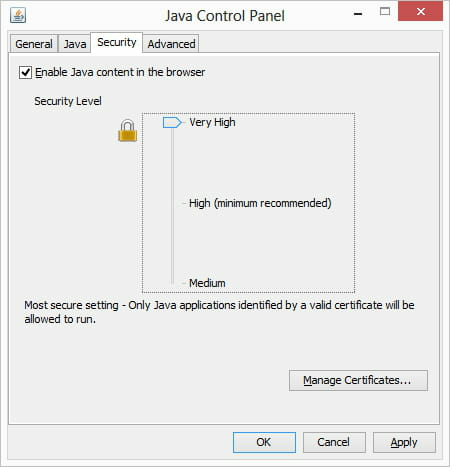 You can for example, configure your browsers to only allow Java apps identified by a valid certificate to be executed. Open the Control Panel > Programs > Java. Set the "Security Level" to "Very High". Published by jak58. Latest update on September 3, 2013 at 09:35 AM by jak58. This document, titled "Windows - Only allow Java apps identified by a valid certificate to run," is available under the Creative Commons license. Any copy, reuse, or modification of the content should be sufficiently credited to CCM (https://ccm.net/).